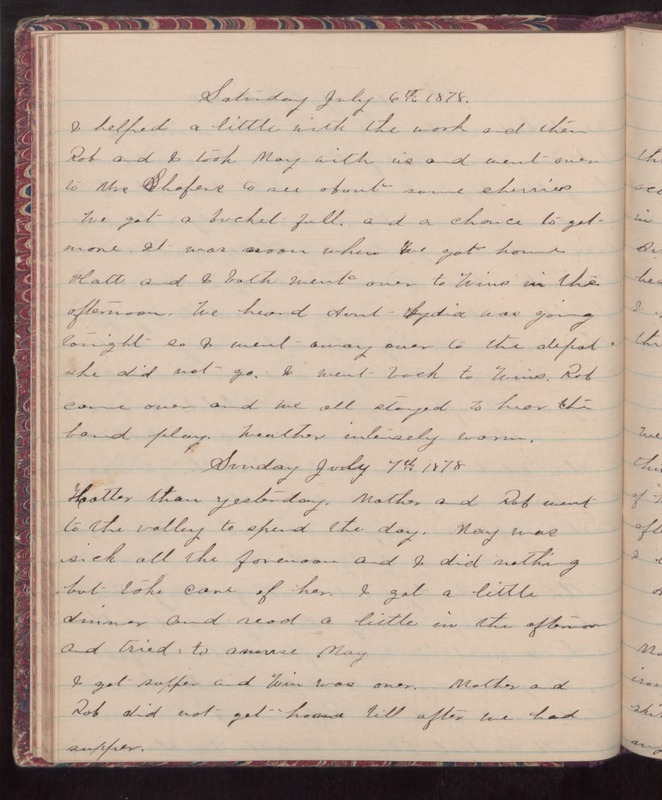 Saturday July 6th 1878 I helped a little with the work and then Rob and I took May with us and went over to Mrs Shafers to see abut some cherries. We got a bucket full and a choice to get more. It was noon when we got home. Hatt and I both went over to Wins in the afternoon. We heard Aunt Lydia was going tonight so I went away over to the depot. She did not go. I went back to Wins. Rob came over and we all stayed to hear the band play. Weather intensely warm. Sunday July 7th 1878 Hotter than yesterday. Mother and Rob went to the valley to spend the day. May was sick all the forenoon and I did nothing but take care of her. i got a little dinner and read a little in the afternoon and tried to amuse May. I got supper and Win was over. Mother and Rob did not get home till after we had supper.